The subscription includes coffees from our current assortment. 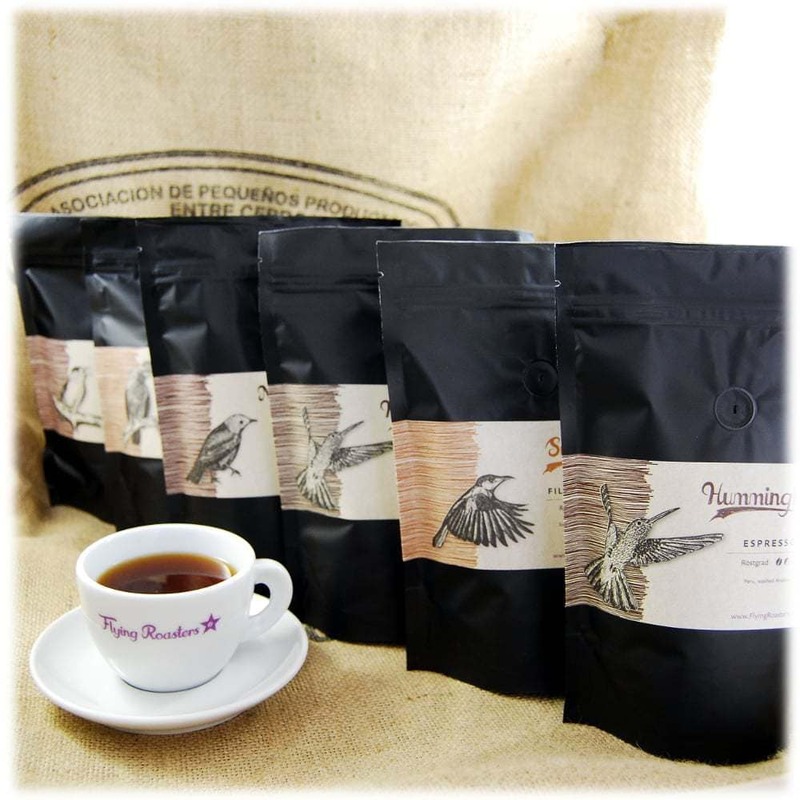 At Flying Roasters – a direct trade, organic coffee roastery based in Berlin, Germany – we only work with coffee of highest quality, meaning first-class green beans, skilled roasting and absolute freshness. As a subscriber, you are also treated to our newest coffees before they become available in our online shop. We always send you two different packs so that you can enjoy the many different flavor varieties. If you prefer a certain type of coffee or flavor, then please let us during checkout know under “Order Notes”. You can adapt, pause or cancel your subscription at any time. There’s no minimum duration or notice period. Monthly payments can be made easily via PayPal, credit card or direct debit. Delivery and payment occur automatically at the beginning of the month (shipped from Berlin, Germany, on the first working day of the month, delivery in 2 to 3 days). If you order today, the first package will be sent on May 1, 2019. A subscription works out cheaper than individual orders because shipping fees are included. With the 5th delivery, we send you an original coffee bag. With the 10th delivery, we send you a cool coffee postcard set. With the 15th delivery, we send you a Flying Roasters cloth bag. With the 25th delivery, we send you our Flying Roasters coffee cups. If you are a bulk purchaser (office, lots of roommates, coffee addict) and want to order multiple packs, then you can use the ± button above to increase the size of the subscription. (As we said, you can modify your subscription and the amount at any time.) If you want an unusual amount, e.g. 1.5 kg, you can use the ± button to achieve this: For 1.5 kg, first put 2 x 500 g in the shopping basket and then 2 x 250 g.
Bester Kaffee den ich trinke. Top Lieferung. Top Service. Bin sehr begeistert. Sehr guter Kaffee und immer etwas zum Ausprobieren dabei. Ich habe die Espresso-Variante abonniert und es gibt immer unsere Lieblingssorte “Nightingale” plus eine meist etwas hellere Röstung, perfekt für mich! Nice to get my coffee automatically shipped now. Personally, I prefer the light roasts. One of my favorites is the Fire Finch. Goldfinch is great too. Keep it up! Do I need a customer account for the subscription? Yes, because you can easily pause or cancel the subscription with the account. See the next question as well. The customer account is easy to set up: You merely have to add a password at the checkout. Can I pause or cancel the subscription at any time? Yes. In your customer account (that you automatically created during your purchase), go to the coffee subscriptions. You can make modifications here. Is there a minimum duration or notice period? No. You can make changes or cancel the subscription at any time in your customer account. Can I modify the type of subscription (filter, espresso, mixed subscription) or the size? Yes, you can also do this in your customer account, which you automatically created during your order. Click “Change subscription type or size” under the coffee subscriptions menu. The monthly payments are made automatically for each delivery. This is possible with PayPal, SEPA direct debit and credit cards. We deliver as soon as payment is made. The money is transferred on the first of the month. We ship on the first working day of the month. It takes 2 to 3 working days for the package to be delivered. Always have excellent coffee at home. Freshly roasted, directly imported from democratic cooperatives, at a fair price (more than Fair Trade), organic/ecological and transparent, from a collective. Not to mention wonderfully tasty! The subscription is cheaper too. You save the shipping costs. Last but not least: You don’t have to do a thing. At the same time, you can make any changes you want. Yes, we also have three-month gift subscriptions where you only have to pay once in advance and you don’t need a customer account. Great, then please get in touch with us. We usually respond very quickly.